I was once asked what I thought the difference was between Josephine Baker and Katherine Dunham. Undeniably, both Baker and Dunham were dance icons of the 20th century. Josephine Baker, who witnessed the East St. Louis race riots of 1917, dropped out of school when she was 12 and began dancing in the streets of St. Louis’s Chestnut Valley neighborhood and vaudeville acts prior to her acclaim in Paris. While Dunham had a difficult childhood, she was raised in a black middle class home. The notable difference between the two women is seemingly social class and formal education. 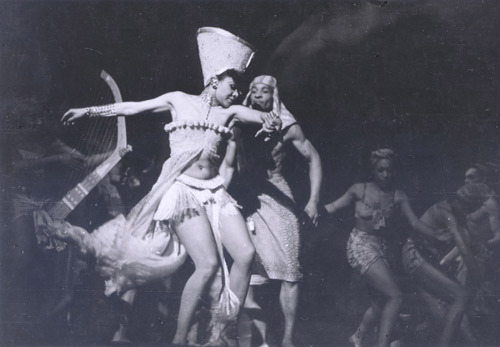 There is no doubt about it, at the height of Dunham’s dance career she was the hottest thing on Broadway and in theaters and cabaret venues around the world—even Josephine Baker attended Dunham’s Paris debut and congratulated her on her success. For Dunham, dance as an extension of her intellectual self was perhaps the primary site for articulating the interwoven political, disembodied, and artistic consciousness that is often divorced from each other. The stage was not only a prime platform for artistic expression but became a prime location to establish her personal freedom agenda by challenging racist conventions of sexuality and in more ways than one, made the invisible black, visible and dignified.